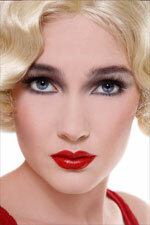 Fashion Wigs - Change Your Look in Seconds! Do you want to be a blonde one day and a redhead the next? Go for short hair or add length with much less effort? - just buy a wig. They are more realistic in appearance than you think.But wigs are not just for fashion. Wigs are also used to cover bald or thin area. To select a wig that would be indistinguishable from real human hair and become your favorite fashion accessory, though, you need to know a few insider tips. First of all, if youre worried that a wig will not look natural on your head, never fear! A properly made wig - even the quality synthetic varieties - can look totally realistic. Synthetic or human hair wigs? Fashion wigs can be synthetic or made from real human hair. Synthetic wigs are cheaper, but the very cheap fashion wigs that you find online dont look real enough. On the other hand, high quality synthetic wigs like Revlon, Raquel Welch or Paula Young wigs look very real. Also, synthetic wigs are easier to care for, as you dont need to restyle them every time you wash them. Real human hair is in limited supply, so human hair wigs are much more expensive; typically they several hundred dollars. Human hair wigs look and feel very natural. However, it is important to know that the quality of your wig depends on the origin of the hair used. The cheapest hair comes from Asian countries, but their texture is different from the hair of European women. The best human hair wigs are made from European hair but, unfortunately, they cost a small fortune. You can get ¾ wigs as well as full wigs. A full wig covers your entire head, so none of your own hair is visible. This type of wig is great when you want to try a color different from your own. A ¾ wig is clipped to the top of your head. Because your original hairline is visible, the wig looks very natural. Also, your head doesnt get toasted under a wig cap. On the downside, though, three quarter wigs have to match your hair color very closely, otherwise it wont look convincing. It is best not to buy this type of wig online because the colors on the color charts are usually not very accurate. A very interesting style of wig is the headband wig. A headband wig is a full wig with a headband attached to its front. It is especially useful if you are always in a hurry, because the headband ensures that none of your own hair is visible. 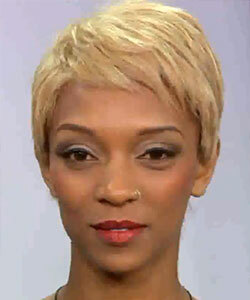 This style is recommended if your natural hair is a dramatically different color from the wig. Wigs come in all shapes and styles - from very short to 30 inches long, in straight, curly, wavy, braided, layered, spiky or the wet look. It is important that you look at many styles before you decide which one your heart desires. It is a good idea to have your wigs customized, too. If you can find a hair salon that can trim your wig to make it fit your face shape, go for it. Customizing a wig isnt cheap, of course, but it will make your new wig look more realistic and suitable for your face. If you feel like a change, get yourself a wig. It is amazing, how much having a different hairstyle can transform a person. And for a woman it is always important to vary her image and look fresh. Zendaya Coleman wearing a wig at 57th Annual Grammy Awards in LA. “I've always wanted to cut my hair and it's one of those things that I've always told my fans… I didn't really cut my hair so don't freak out,” Zendaya admitted to Entertainment Tonight. 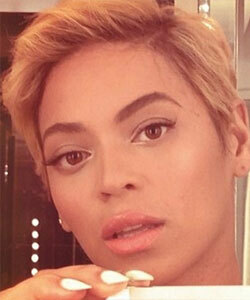 Did Beyonce Cut her hair or is this a wig? Celebrities and models use wigs to appear as if they cut their hair short - So which photo is a wig and which one is real? Katie Holmes turned heads with her cleopatra inspired blunt bob hairstyle at the Metropolitan Museum of Art - New York City on May 2015. But it was only a wig! - She always looked gorgeous with bob hairstyle.